Raising a toddler keeps you on your toes! BabyCakes is often running around the house at full speed and finding her way into every nook and cranny that she isn't supposed to be in. I love it though. She is so FUN right now. She loves to play and laugh. Seeing her happy makes me happy. That doesn't mean that toddler-hood isn't still exhausting at times. Next to nap time, the calmest time of day is snack time. Snack time keeps her still and I can relax a bit. Unlike meal time when dishes can be hit or miss, for snack time I always choose things I know she loves, like Gerber Lil' Beanies. "Look Mom! No artificial flavors, colors, or preservatives!" 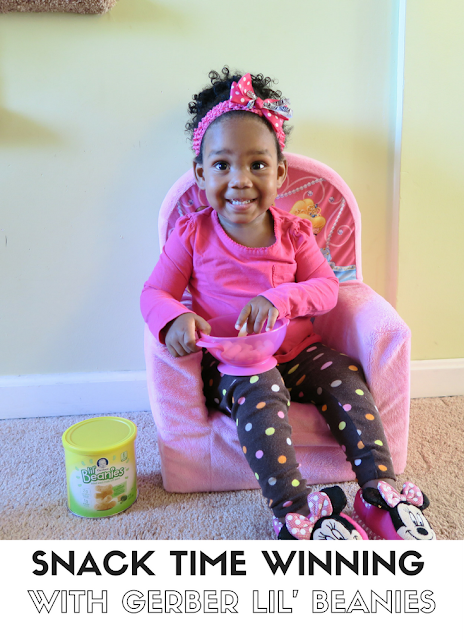 Gerber Lil' Beanies is a win-win for me and BabyCakes. She loves them, and I get to take a break while she eats them! They're a great option for parents looking for a nutritious snack with no genetically modified ingredients. This little baked snack is made with the goodness of navy beans and is one of her favorites. If they make her happy they make me happy! It is important to give children good snacks that keep them healthy and happy. Your little one looks like she is enjoying them.